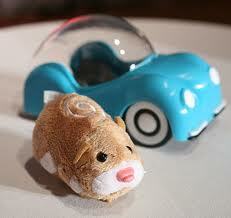 Toy sellers say Zhu Zhu the pet hamster is still the top-selling toy for kids this Christmas. Winner of the 2010 Toy of the Year Award, this furry animal with various characters has been flying off the shelves since last year. Aimed at kids, generally girls aged three and up, Grant Barber of Toys Toys Toys at the Eaton Centre said he has sold hundreds of Zhu Zhus ($8.99 per hamster; $20 for the house) in the past few weeks. "They were popular last year, but again this year," said Barber. Barber said that mainstay items like Lego and remote control cars are still popular with boys. For girls, it's Barbie, Beanie Babies and My Little Pony. "Parents like to give their kids things from their childhood, but kids also ask for them, too," said Barber. A pricey, but exciting item on Toys R Us' list this is season is the Kinect Xbox 360 ($149), a sensor that uses full-body tracking to mirror your movements and is compatible with every Xbox 360. "It's a great game that the whole family can play. I know my family loves it," said Toys R Us' Chief Playing Officer, Daniel Wilson, 14, of Uxbridge. The teen tests and rates toys for the company and said the Kinect is great because it "puts you in the game and you are in control of it." Some other items on his top-10 list is the Barbie Pink Vacation Jet ($99). "It starts the girl's imagination and gets it running wild with the little microphone, the chandelier, it's fantastic for playing," he added. Beyblades, a spin-off on spin taps, have also seen a resurgence. "They were big ten years ago but it's now made from die-cast metal and each player spins one off and bang against each other, and the one who stands, wins," said Barber. Beyblades are retailed at $15 to $30 and can go up to $70 for the big battle set. For families, board games like Scrabble and Monopoly are still popular. Silly Bandz were all the hype this summer after teen sensation, Justin Bieber, was seen wearing them. They range between $3 to $6. Bieber also launched his own doll this fall which is expected to be all the rage under the Christmas tree this season. According to the Canadian Toy Association, green and eco toys have been on the conscience of parents as well. "Kids can build a sustainable earth lab or play in an ‘eco' town. They can experiment with solar powered toys and cuddle with a natural plush animal made from pure cotton fibers," said CTA media relations manager Carol McDonald in a statement. With Christmas being only weeks away, Barber says 70 per cent of his shoppers are procrastinators. "[Parents] usually start coming in about a week and a half before Christmas," he said, adding that his shop is usually well stocked even after the holiday season to curb disappointment.